The studio’s space, which opened in November, is subdivided into a pair of noise-resistant, surround-sound rooms, as well as quiet spaces, community areas and a retail section. Shades of white and subtle curves dominate. Keledjian wanted the space to reflect sensory touch points and and accessibility, making it simple and unobtrusive to navigate, and more importantly, approachable to those unfamiliar with the practice. There are natural linen seats, natural bamboo shelves, floating ceiling lights, piped-in aromatherapy, and the “subtle sound of soft gongs throughout,” Sisson adds. All the better to get your om on. 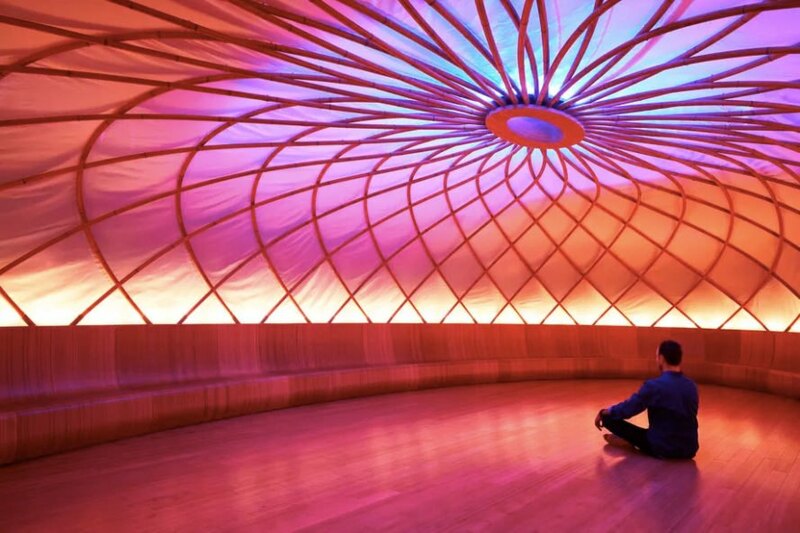 The room is as enveloping as you’d want a soundproof space near the clamorous Manhattan streets to be, with a signature scent wafting throughout the room, colored light shining through the sail cloth ceiling, dimming down as the session progresses, and the steady, soothing (recorded) voice of a meditation guide wafting through the speaker system. Sure, it sounds a bit whoo-whoo, but we live in a surreal, destabilizing time; whoo-whoo just might offer us a way to transcend it.